With talks of the U.S. losing in trade deals, there is a surprising victory with our southern neighbor. Mexico ranks in the top 20 oil-rich countries. Despite its vast oil reserves, it has to import our gasoline. Mexico has a refining problem, and it needs the U.S.
To understand why, we have to take a couple steps back. For the better part of a century, Mexico controlled its domestic oil and gas through its national oil company, Petróleos Mexicanos (Pemex). However, starting in the 2000’s, cracks began to show in the state-run monopoly. Poor management, lack of reinvestment and outright theft caused production to slow. The nation cut gasoline subsidies in hopes that higher prices would attract outside investors. While prices rose, it did little to draw interest. Drug cartels seized this opportunity. Criminals attacked refineries and tapped into pipelines. The stolen gasoline brought them huge profits. The early success strengthened their resolve. According to officials, illegal taps occur about once every mile along some pipelines. The refiners, already suffering from under-investment, fell into disrepair. The industry fell to ruin, unable to turn the nation’s oil into refined products like gasoline. That brings us to the situation today. Mexico is pumping oil to the U.S., skipping the refineries and most of the thieves. This has been a boon to American refiners, which prefer Mexico’s heavy crude oil. They can supplement this supply with shale oil and send it back to Mexico. Shipping the gasoline back is benefiting another American industry — the railways. To get past the fuel thieves, trains carry the gas south. This is a costly alternative to traditional pipelines. This broken system has only hurt the people of Mexico. The nation now imports 75% of its gasoline, according to Bloomberg analysts. Prices have risen over 25% in recent years despite falling oil prices. 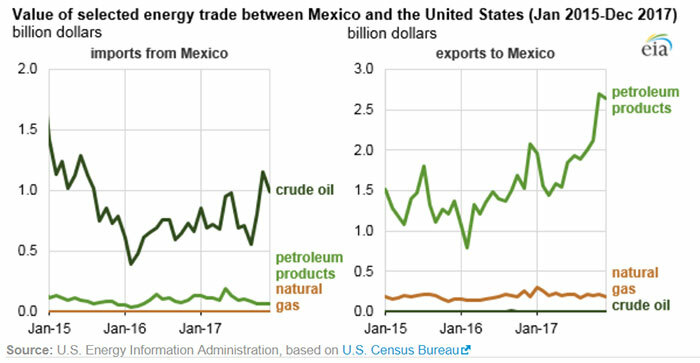 Mexico’s oil troubles are an opportunity for U.S. companies. It’s a sector we’re keeping a close eye on at Real Wealth Strategist.